Why is IDrive Online Backup so fast? 1. The IDrive platform is built and maintained by us. Why is this important? Well, there are more online backup “companies” out there than there are data storage networks. Many of these online backup “companies” are utilizing third-party storage platforms (i.e. Amazon’s S3) to host their customers’ data for various reasons: they don’t have their own internal infrastructure talent, they don’t have the resources to build and maintain their own racks and they want to reduce costs. IDrive customers’ data is held on our privately-owned, developed and secured network – and it’s REALLY FAST. 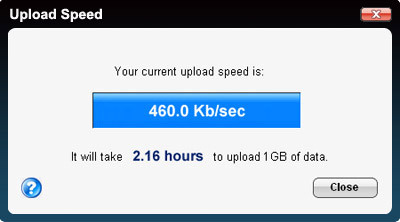 Try it out for yourself: open a free 5GB account, download the software to your Windows or Mac and run a bandwidth test. This will tell you just how quick the connection is between your computer and our data centers. We even have customers backing up their computers on the island of Cyprus in the middle of the Mediterranean Sea! IDrive’s technology for backing up files is intelligent and strong. It actively accounts for network issues during transfer, insuring you don’t have to hover near your computer making sure your backup is still running. Just install and that’s about it! 3. Rapid Serve for when it’s not fast enough. Imagine you walk in to your office one morning only to find your building had been struck by lightening the night before and all your technology has gone haywire. You have an IDrive account with 250GBs of your photos, invoices and customer records and you won’t have a working computer for a few days because of the disaster. That’s why we have Rapid Serve. Rapid Serve is a program that utilizes IDrive Portable, our 320GB USB-powered backup hard drive. The cost of the drive is $69.95 + tax with free shipping to US customers; the Rapid Serve program is free. It could take days to download your whole backup depending on how much data you have and how fast your Internet connection is. With Rapid Serve, our network team will physically download your data to an IDrive Portable and ship it via USPS. Now that’s fast disaster recovery – and the price can’t be beat. Check us out on Twitter and Facebook for more news and special promotions.